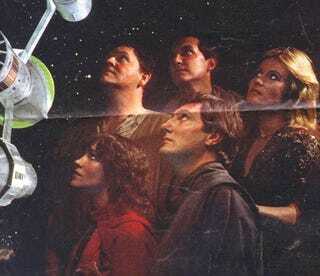 You've heard great things about Blake's 7, that edgier 1970s show from some of the makers of Doctor Who. You've heard it features darker, more complex characters, and it's like a warped mirror held up to Star Trek's utopian future — instead of the human Federation being this amazing force for peace and justice in the galaxy, it's evil and oppressive. You've heard it includes dialog so sharp you could shave with it. But how can you discover this show for yourself? Here are some handy tips. This list actually came about because I had a friend who was interested in the wonders of B7, and I was starting to write her a long email with advice on discovering the show. Then it occurred to me that other people might actually find this useful. Anybody who has enjoyed shows like Babylon 5, Star Trek: Deep Space Nine or Firefly will find a lot to love about the anti-heroic Blake's 7, whose DNA is woven into the most daring SF on television. Find a friend who has the VHS tapes. Because of legal stupidities the DVDs aren't available in the U.S., but you could import them from the UK if you have a region-free player. There are also other ways to get the episodes, which we absolutely won't mention here. Go ahead and read spoilers. Blake's 7 is that rare show that's actually 1,000 times better if you know how it ends. I won't spoil the ending here, just in case you may disagree. But knowing the ending gives a new significance and poignancy to many scenes in the first two seasons. Feel free to skip the first episode. It's pretty good, but it's like a pilot for a different show. Pretty much none of the characters and threads from the pilot make their way into the following episodes, except for our hero, Blake. All you really need to know going into episode two is the show's main premise. And here's that main premise: it's the distant future, after humanity has colonized much of the galaxy. The evil Federation rules over most human worlds with an iron grip. Only a few rebels still hold out against the Federation, and their greatest, most legendary leader is Roj Blake, who gets stuck on a prison transport on a one-way trip to a prison planet. There, he has no choice but to team up with some unrepetentant criminals to fight for freedom. And maybe, over time, he can mould them into a force for more than just escape. Be willing to suspend your disbelief a bit in the first season. Blake and his crew have a run of good luck that's pretty hard to swallow, including stumbling on the greatest spaceship in known space and later inheriting the most awesome computer ever built. Just run with it, because it sets up some great stories later. And it's no different than lots of other science fiction shows, where the hero just happens to have the greatest time machine/spaceship/whatever in the universe. The first season may require some patience, and you should feel free to skip some episodes liberally. The first season is a bit of a slog, because the show's creator Terry Nation wrote the whole thing himself. And this meant he was dashing off drafts as fast as he could, and then zipping to the next episode without looking back. Script editor Chris Boucher managed to add some sparkling dialog here and there, but there are also long stretches of padding and repetitive plot devices. The scripts improve a lot in season two, when Nation is no longer single-handedly writing them. Here's a compilation of some of the best quips and insults. You may also want to watch "Orac," the season finale, which sets up some stuff in the next season. And three other episodes, "Mission To Destiny," "Breakdown," and "Bounty," are amazingly great, but non-essential. Things to watch for: Servalan's outfits become more and more vampy as time goes by. Almost every episode has a cameo by someone who appeared on Doctor Who from time to time. The show's special effects get cheaper and cheaper, until some episodes actually just feature a cardboard cut-out of Blake's ship, the Liberator, instead of model effects. But the show scores points for having a teleportation effect that actually makes people have trouble finding their footing when it plunks them down. Blake's 7 reaches its creative peak, and becomes more of an arc show, in season two. Watch for the relationship between Blake and the morally dubious computer nerd Avon to become more complex and twisted throughout season two. Also, Blake himself becomes more and more of a morally gray character as the season goes on. He's more and more willing to go to any lengths — make dubious alliances, take ridiculous risks, even condemn whole populations to death — to defeat the Federation. Blake's 7 gets a lot of credit for being a show with an overarching story arc, setting the stage for show's like Babylon 5, Deep Space Nine and the new Battlestar Galactica, and much of that reputation rests on season two. Almost every episode in season two is amazing and worth watching at least once. There are a couple of exceptions: awful filler episodes that you should skip at all costs. They're called "Hostage" and "Voice From The Past," and you'll be much happier if you just give them a pass. You'll notice that Travis, the number two bad guy, gets a new actor in season two. He also suddenly becomes a much, much more interesting and complex character. In season one, he's all about, "OMG Blake hurt me, so I must hunt him down." But in season two, he's been through a "reeducation" process (which is how they explain the new actor) and is a little less sure of himself. And his allegiances become a lot less clear, especially after the Federation hangs him out to dry. "Trial," the episode where Travis is put on a showtrial for war crimes — which he actually commited, but which are just a pretext — may be the best episode ever. Travis stands up in front of a jury of his superiors and explains, in a ringing speech, that war crimes are a logical outcome of his Federation training, not the aberration the judges would like to pretend. It makes the trial of Baltar in Battlestar seem like Matlock by comparison. Without getting too spoilery here, season three takes a very sharp turn away from the solid arc-focused nature of season two. To be honest, if you haven't become totally hooked on Blake's 7 by the time you get to the third season, there's probably no hope. However, it does contain a few of the absolute best episodes of the entire show's run: "Aftermath," where Avon gets to know the evil Servalan a lot better, "City at the Edge of the World," where the cowardly thief Vila finally gets to be a hero, and "Rumors Of Death," in which Avon tracks down the Federation agent who killed the only person he ever cared about. A lot of the rest of season three is sort of filler, and ranges from pretty good to awful. Skip "Volcano," "Dawn Of The Gods" and "Children of Auron" at all costs. "Harvest of Kairos," "Sarcophagus" and "Moloch" are okay for camp value, but that's it. You can watch the best of season three in a day. And season four is much, much worse. Apart from a few episodes ("Traitor" and "Headhunters" come to mind) it's just pure camp and silliness. The producers didn't expect the show to be renewed for a fourth season, so this run was just sort of an added bonus, with some scripts that seem to have been rushed out. But of course the final ever episode of the series, "Blake," is a must-watch, and a return to the greatness of the second season. I won't spoil what happens in it here, but you should definitely check it out. You may even want to be daring and watch the final episode first, and then go back and watch the rest of the show from the beginning. The last episode is pretty self-explanatory, and will definitely leave you curious about these characters and how they got to this point. And here it is!